Maybe instead of collision boxes, you could use a 'Get Property' on the UIPopupLists's textLabel's property, set it to everyframe, then you could use a 'String Compare' set to everyframe, to watch for any user changes to fire off an event. This came at just the right time! Does anyone know how to block actions behind a button? For example, if you click a button, you don't want anything to happen to game objects behind the button. it seen that using set property cannot change ngui's sprite color, is that some way to change it?? So: Use "get property", store the color in your variable, and then you modify this color and inject it back using "set property"
i have 2 FSMs in one object and i want to send the OnClick to FSM #2 but the script only send the commands to the first FSM . any way around this ? 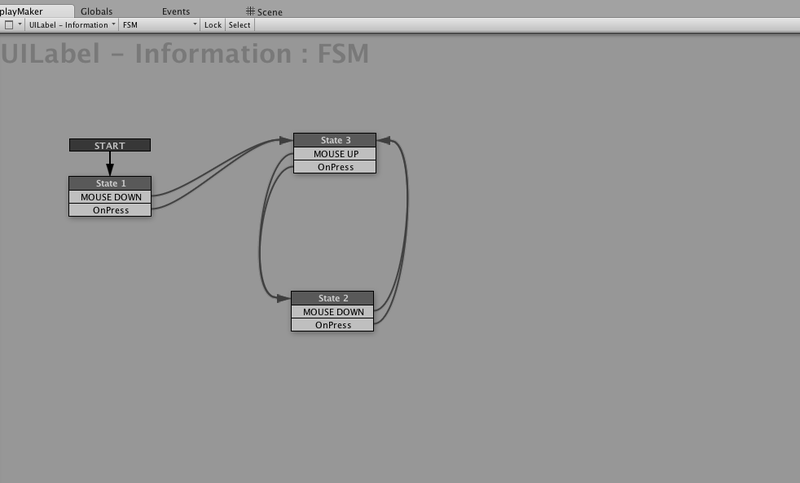 You can send an event to a gameObject which will send that event to all the FSM attached to this gameObject. Have you tried that? What technic do you use currently? i have used the script in the first post . If you are sending a message to the gameObject, then yes, the first component is picked up. the solution when that happens is to reference the Fsm component directly, the trick is to drag the component itself, not the gameObject, because dragging the gameObject will pick the first FSM component. How would i go about doing an OnPress released (or up) instead of pressed? I know OnPress is set up as a bool. How do i make a playmaker action that sends OnPress as up instead of down? OnPress event seems to toggle the bool for me. Heres a picture. why does all action like mouse pick and raycast dosent detact the objects on the NGUI ? how can i do it right ? I'm not sure how NGUI makes it possible to detect button clicks in Game View. To detect raycasting, I'm putting an empty game object with a box collider behind the NGUI items, using the main camera. If you figure out a better way, maybe you can share? .